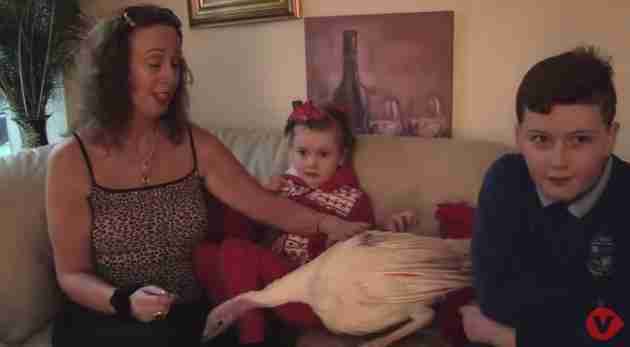 When a family in Northern Ireland asked their little girl what she wanted for Christmas, she gave them the most unusual answer - a turkey. At only 6 years old, Athena Bryson is a major animal lover and decided that all she really wanted for the holidays was to adopt a turkey who would otherwise be slaughtered for a Christmas dinner. Her parents were taken aback at first, but that's what she wanted. And so that's what she would get. Athena's mother began searching online, trying to find someone who had a turkey they were willing to spare. Finally, she did. That same afternoon, a special turkey named Valerie Lucky, who was supposed to be slaughtered the next day, came to join the Bryson family. The family lives on a farm, so Valerie Lucky was welcomed into a very animal-friendly, loving home. She's treated just like a member of the family and Athena couldn't be more pleased. This isn't the first time Athena has asked to be a hero for a special occasion - last year for her birthday, she received two orphan baby lambs who she then proceeded to take care of by herself, every day. Athena is also the only member of her family who is a vegetarian, according to the Belfast Telegraph, and she proudly made that decision all on her own. When asked why she doesn't eat animals, Athena says it's because she loves them too much. Sounds like Valerie Lucky couldn't have found herself a better home - or a better friend. For how to care for a turkey, check out this information from Farm Sanctuary.